It’s November already! You know what that means…comfort food, whether it’s a casserole or a meal in frequent rotation, or a dish your family has always enjoyed for Thanksgiving. This month I’ve got three great recipes for you–one is a casserole my family loves. It’s easy to throw together and has a great mix of flavors and textures. One is a breakfast treat that we make about once a year (and yes, we made it this past weekend). It makes a lot, so it’s great to have when you’re entertaining holiday guests. The third is a recipe for potatoes that are to die for. A friend gave me the recipe years ago. One of these days I’ll do some light recipes, but like I said, these are comfort foods. Comfort food is usually a little heavier and more calorie-laden than light dishes. Place beans on bottom of 13×9″ baking dish. Mix remaining ingredients, except cheese. Spread mixture over beans. Top with cheese. Thaw bread dough in fridge for 12 hours or follow quick-thaw instructions on back of package. Combine 1 c. sugar, brown sugar, milk, butter, and 1 1/4 t. cinnamon in a saucepan. Bring to boil and cook for 1 minute, allowing mixture to boil the entire time. Remove from heat and allow to cool for 10 minutes. In a shallow bowl, combine 1/4 c. sugar and 1/2 t. cinnamon; stir well. Coat Bundt pan with cooking spray. Cut each loaf of bread into 24 equal portions. Roll each piece between palms to form a ball and roll ball in sugar mixture. Layer the dough balls in the Bundt pan. Pour warm sugar syrup over the dough. Cover pan and let rise in a warm place, free from drafts, for 35 minutes or until doubled in bulk. I preheat the oven on to 200 degrees while I prepare the dough, then I turn the oven off and place the pan in the oven for the rising time. Works very well. Uncover and bake for 25 minutes or until lightly browned. Immediately loosen edges of bread with a knife or thin spatula. Place a plate upside-down on top of the Bundt pan and invert the bread onto the plate. Drizzle remaining syrup over the bread. Place potatoes and 1 T. salt in a large saucepan with water to cover. Bring to a boil, then lower heat and simmer, covered, for 25-35 minutes, until potatoes are completely tender. Drain. In a small saucepan, heat the butter and half-and-half. Put the potatoes in a large bowl and use a hand mixer on low speed for a few seconds to break them up. Slowly add the butter-cream mixture to the potatoes, mixing on the lowest speed. The last quarter of the butter mixture should be folded in by hand. Fold in the sour cream, Parmesan cheese, remaining salt, and pepper. Taste for seasoning and serve immediately. If the potatoes are too thick, add more hot cream and butter. To reheat, place smashed potatoes in a baking dish and sprinkle with extra Parmesan cheese. Bake at 400 degrees for 20-30 minutes or until top is lightly browned and potatoes are heated through. Enjoy! And as always, if you’ve got a great recipe to share, please email me at amymreadeauthor@gmail.com and I’d love to include your contribution! This entry was posted in First Tuesday Recipes and tagged breakfast treats, food for company, houseguest menus, Thanksgiving sides. Me too! There are places around here that sell nothing but monkey bread. I first had this about twenty-five years ago, and it’s been in my rotation ever since. Everyone likes it. I hope you do, too! Yum. I plan on trying the chicken casserole. But, since I’m cooking for one, I’ll have to reduce the ingredients or have a whole lot of leftovers. On the other hand, nothing wrong with leftovers when it’s something good. That’s true, John. I think cutting the recipe in half and planning to have a bit of leftovers is a good idea. I hope you let me know what you think of it! I hope she makes one of them for you. 🙂 Enjoy! These both look hearty and filling on a cold winter night! HA! No, I think they can be healthy, just more robust for the cold winter months! You’re right, actually. 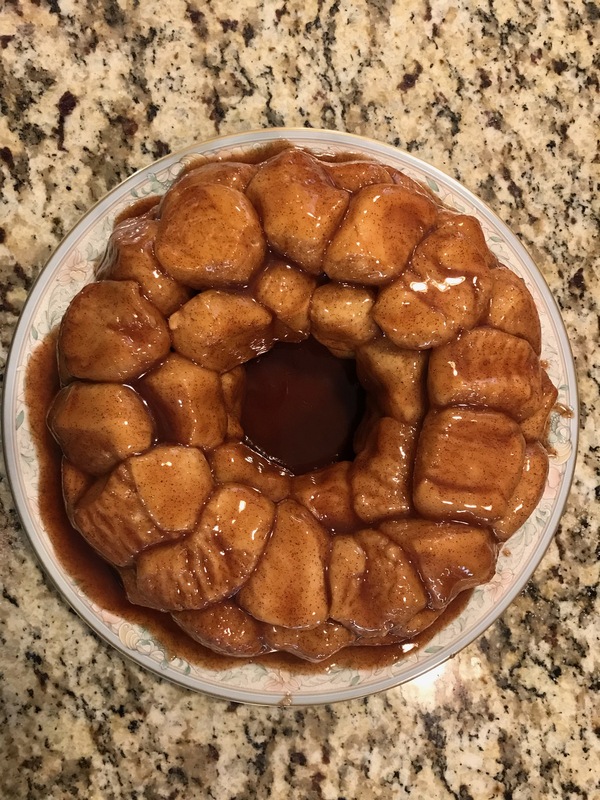 You could definitely cut the amount of sugar in the monkey bread and you could use the healthier soups for the casserole. As for the potatoes…they’re perfect just the way they are. I guess moderation is the answer! You are right – moderation is the key…but even if you followed them faithfully, they ARE for cooler winter nights, so I need some extra padding!